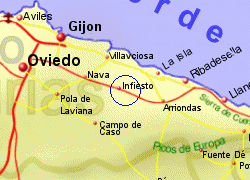 Infiesto is a small town which lies 40Km east of Oviedo, between the Costa Verde coastline of Asturias, the picturesque Redes Natural Park and the stunning Picos de Europa. 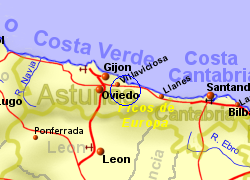 The village sits on the river Piloña, spread out along the wooded valley with green fields beyond, and is serviced by the narrow guage railway which runs along this valley from Santander to Oviedo. This is great walking country and other activities in the area include horse riding and kayaking. 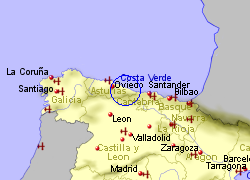 Map of the Infiesto area.